Anybody need some swag? Some real nice swag? Marvel TV has announced that it is auctioning off a number of now iconic props from their Netflix shows. Luke Cage, Daredevil and Iron Fist hit the Netflix world pretty hard, with some good reviews and fans coming on board to support the MCU series. 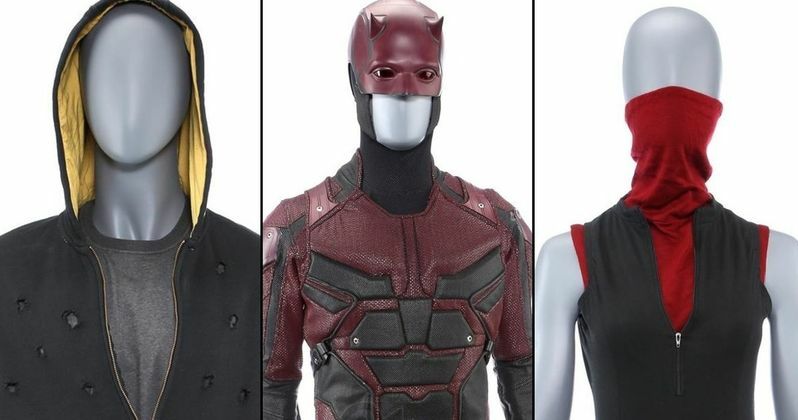 Now props from the superhero shows will be hitting the auction block in a mass movement of merchandise for Marvel. In an official statement it was announced that Marvel TV will host a live auction, "featuring original costumes, props and set decoration from Marvel's Daredevil, Luke Cage and Iron Fist." The auction will be held in partnership with Prop Store. Over 750 Lots will be on sale during two days of non-stop bidding action. Marvel TV had entered a deal with Netflix a while ago to use the comic characters in their streaming programming. A lot has happened and now the two giants have gone their separate ways, canceling all their collaboration deals. The latest cancellation came last month when the plug was pulled on The Punisher and Jessica Jones. Jessica Jones was about to start season 3 when the news dropped, so the disappointment with the news, while not a complete surprise, was still hard to take for some fans. Now that the shows are all wrapped up, Marvel Studios is unwrapping on-screen costumes like Matt Murdoch's Red Daredevil Suit. The bloodbath of cancelations started way back last year in October with Iron Fist. That word came on the heels of Iron Fist having a much better second season. Fans of the show were looking forward to the continuing story, but the axe came down on one superhero after another in rapid succession. A week after the Iron Fist show got cut, we had another victim. Luke Cage was axed despite the show leaving us with a big cliffhanger and Mike Colter excitedly teasing expectations for the third season of the show. Most people just assumed viewers had dropped off from the shows so the deal with Netflix just wasn't paying off in the dividends that would make the continuing relationship between the two companies prosperous for all involved. Marvel TV rolled out Daredevil season 3 to outstanding critical praise. The show was very well received all the way around so the news that Daredevil would get the axe too kind of shocked everybody. After taking down that many of it's benchmark Marvel character based shows, it was clear, that Netflix and Marvel TV were basically done. With filming any future footage just not happening, the staff on hand has put together an auction of epic proportions. The event will happen in August of this year at the physical location of the Prop Store's auction facility in Los Angeles County, California. Don't sweat it if you can't make the trip out here to buy some super cool stuff. The people have it set up so you can put in your bid online at www.propstore.com/marvel. The giant sale will open in July, so you will have plenty of time to line up some cash before your favorite prop goes up for grabs. This story comes from Marvel Prop Store.